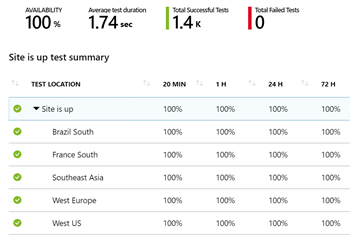 For example, I have used a number of 220;health check221; services like elmah.io, pingdom.com, or Azure’s Availability Tests. I have tests that ping my website from all over the world and alert me if the site is down or unavailable. I’ve wanted to make my Health Endpoint Monitoring more formal. You likely have a service that does an occasional GET request to a page and looks at the HTML, or maybe just looks for an HTTP 200 Response. For the longest time most site availability tests are just basic pings. Recently folks have been formalizing their health checks. You can make these tests more robust by actually having the health check endpoint check deeper and then return something meaningful. That could be as simple as “Healthy” or “Unhealthy” or it could be a whole JSON payload that tells you what’s working and what’s not. It’s up to you! Is your database up? Maybe it’s up but in read-only mode? Are your dependent services up? If one is down, can you recover? For example, I use some 3rd party back-end services that might be down. If one is down I could used cached data but my site is less than “Healthy,” and I’d like to know. Is my disk full? Is my CPU hot? You get the idea. You also need to distinguish between a “liveness” test and a “readiness” test. Liveness failures mean the site is down, dead, and needs fixing. Readiness tests mean it’s there but perhaps isn’t ready to serve traffic. Waking up, or busy, for example. If you just want your app to report it’s liveness, just use the most basic ASP.NET Core 2.2 health check in your Startup.cs. It’ll take you minutes to setup. If you’re using Kubernetes you could hook up the Healthcheck to a K8s “readinessProbe” to help it make decisions about your app at scale. Now, since determining “health” is up to you, you can go as deep as you’d like! The BeatPulse open source project has integrated with the ASP.NET Core Health Check API and set up a repository at https://github.com/Xabaril/AspNetCore.Diagnostics.HealthChecks that you should absolutely check out! Using these add on methods you can check the health of everything – SQL Server, PostgreSQL, Redis, ElasticSearch, any URI, and on and on. Just add the package you need and then add the extension you want. You don’t usually want your health checks to be heavy but as I said, you could take the results of the “HealthReport” list and dump it out as JSON. If this is too much code going on (anonymous types, all on one line, etc) then just break it up. Hat tip to Dejan. At this point my endpoint doesn’t just say “Healthy,” it looks like this nice JSON response. I could add a Url check for my back end API. If it’s down (or in this case, unauthorized) I’ll get this a nice explanation. I can decide if this means my site is unhealthy or degraded. I’m also pushing the results into Application Insights which I can then query on and make charts against. Then I can hit /healthcheckui and it’ll call the API endpoint and I get a nice little bootstrappy client-side front end for my health check. A mini dashboard if you will. I’ll be using Application Insights and the API endpoint but it’s nice to know this is also an option! It’s super flexible. 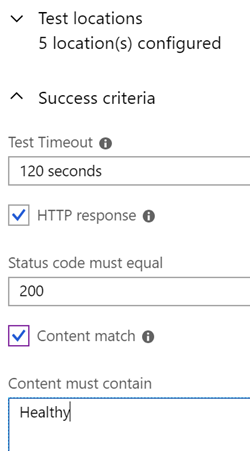 You can even set up ASP.NET Core Health Checks to have a webhook that sends a Slack or Teams message that lets the team know the health of the site. Check it out. It’ll take less than an hour or so to set up the basics of ASP.NET Core 2.2 Health Checks.